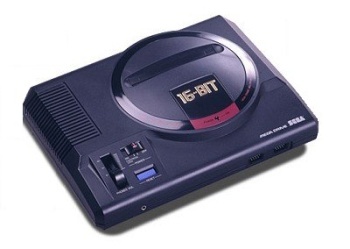 The Sega Genesis (known as Mega Drive outside the USA) is a 4th generation console created by Sega. It was a direct rival to the SNES. It later received two peripherals in the form of the 32X and Sega CD/Mega CD. 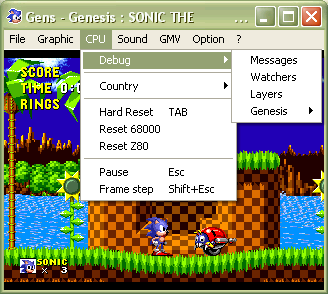 Gens KMod is a modification of the Gens emulator that adds various debug functions. You can download it Here. 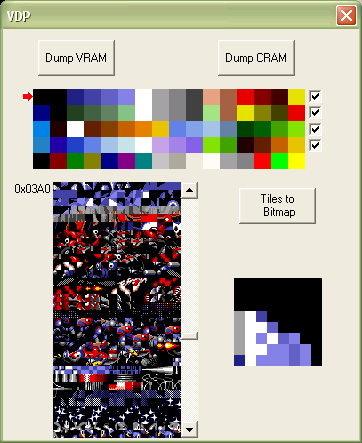 Now you have two options: you can either save the tiles to a bmp file, by using the "Tiles to Bitmap" button, or you can Print Screen and paste on Paint or another image editing program to edit. Much like Kmod, DebuGens is also a hack of Gens to add debug functions. You can download it Here. DebuGens includes the same options as Kmod, as such the methods for ripping are the same. See here for more info. Please note that a large majority of games are compressed with some games able to rip just the main character or nothing at all without extra tools. BizHawk uses the Genesis Plus GX emulator and adds a tile/background viewer however... 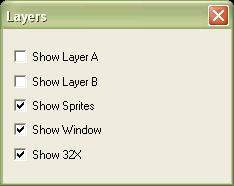 If you change palette, it crashes the entire emulator and the tiles in the tile viewer are not correct in size so it's really only good for ripping backgrounds with the viewer. Like GensKMod though, you can disable the layers and turn the background pink (or any color). See below in regards to emulation quality. Kega Fusion emulates the Genesis, the 32X and the Sega CD as well as SG-1000, Master System and Game Gear. For years, this was considered the best Mega Drive emulator however it has not been updated in years making it harder to run on modern computers that run on Windows 10 as well as features that no longer work such as the MSN Messenger display. Despite being a newer emulator, BlastEm is a fast and an accurate emulator that supports the Genesis as well as the Master System using the backwards compatibility mode. Even able to run tech demos such as Titan Overdrive that Kega Fusion and other emulators struggle with. Just like Kega Fusion, it works on Windows, Mac and Linux. In the future, there are plans for Sega CD and 32X emulation as well as a better GUI (currently it is using a ROM based menu). After Kega Fusion but before BlastEm, this was considered the most accurate emulator due to its sound and emulation in regards to compatibility running most games including Virtua Racing. It runs Sega CD games as well but not 32X due to its platform choice of that it can not cope. While it was developed with the Wii in mind, you can play on it on your PC via RetroArch or BizHawk. While not having any debugging features, it does include a layer removal feature. It should also be noted that this emulator will not run Sega CD or 32X games. This page was last edited on 28 August 2018, at 02:49.